Entertainment was instrumental in passing time, particularly during the winter when short days and poor weather prevented the internees spending little time out of doors. Musical and theatrical performances occurred frequently with Camp 4 alone having seven theatres, one for each compound. These seven theatres put on an incredible 79 performances over the six months preceding April 1916 most of which were comedies from England and elsewhere in Europe. 61 classical converts and 21 open air concerts were also performed during the same period, while these figures do not take into account the performances by the choral societies (Report on Knockaloe Camp, IOM, NA). The emphasis on comedies in the theatrical productions fits well with the idea of passing time, providing light relief and enabling the internees to distract themselves for a short while from their circumstances. 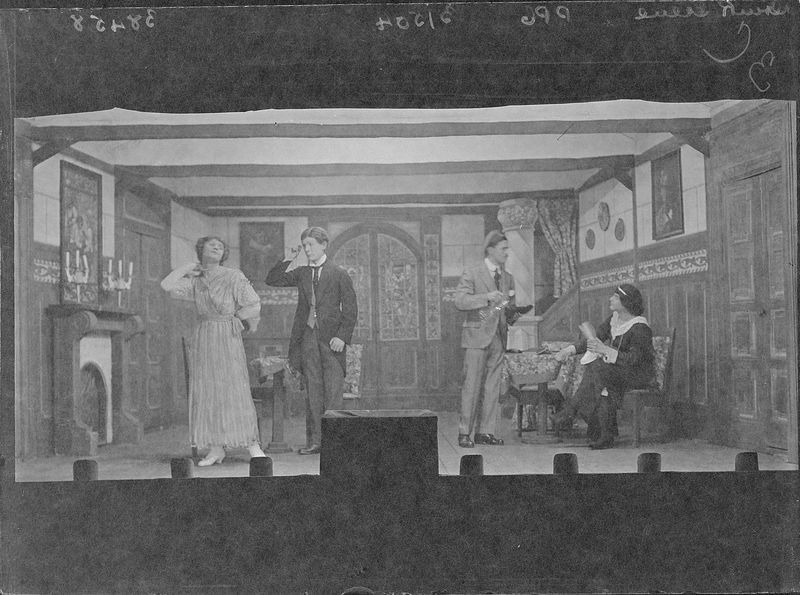 Entertainment had further benefits beyond the performance itself as the members of the various choirs, theatrical companies (see figure 63 and figure 65), orchestras and bands all had to spend time rehearsing. This also added structure as with so many societies it is likely that various companies would have been allotted specific rehearsal times. Benefits also went beyond the performance for those who watched as these events acted as something to look forward to and reminisce on, and provided something positive to talk about. Education grew to have an important role in camp life with academic internees sharing their knowledge and teaching a wide range of classes from mathematics and languages to veterinary science. This provided an opportunity for internees from poorer backgrounds who would never have otherwise had the opportunity to obtain such an education. For many the hardest time would have been at night. The time spent alone with their thoughts, dreaming and worrying of friends and family at home. With no option but to remain in their huts over night the time would have passed slowly and when sharing a hut with so many others there must have been constant noise acting as a constant reminder of where they were. Rehearsing lines, learning lyrics or working on costumes may have been a welcome distraction. The ever present thought of home is visible on much of the artwork from the camp, particularly the postcards. Scenes of looking out to sea are common, while holiday cards are particularly poignant (see figure 60). Letters and craftwork designed for family members, including a beautifully stitched pair of child’s booties (see figure 61) also highlight the ever present thoughts of family and friends elsewhere. Artists interned in the camp would also use their skills, setting up studios and providing portraits for the internees to use to decorate their personal space or to send back home to loved ones (see figure 64). The all-male environment of the camp can only have compounded the unusual situation the men were in and just how different it was from normal life. One of the ways in which the men tried to redress this was with the use of cross dressing (see figure 66). Men took on the women’s roles in plays and theatrics performed in the camp and the costumes and make up show a significant investment in time and effort to ensure the effects were impressive. The appearance of ‘women’ in the camp was not just for shows though, with men taking the role of waitresses in the camps makeshift cafes, enabling the men to pretend they were having a normal everyday experience. For many men, this feature of camp life was purely to make things feel a little more like home but there would undoubtedly for others have been a sexual element, particularly given the length of their internment experiences.